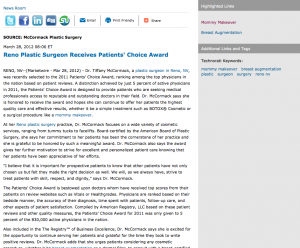 Reno, NV — Dr. Tiffany McCormack, a plastic surgeon in Reno, NV, was recently selected to the 2011 Patients’ Choice Award, ranking among the top physicians in the nation based on patient reviews. A distinction achieved by just 5 percent of active physicians in 2011, the Patients’ Choice Award is designed to provide patients who are seeking medical professionals access to reputable and outstanding doctors in their field. Dr. McCormack says she is honored to receive the award and hopes she can continue to offer her patients the highest quality care and effective results, whether it be a simple treatment such as BOTOX® Cosmetic or a surgical procedure like a mommy makeover. At her Reno plastic surgery practice, Dr. McCormack focuses on a wide variety of cosmetic services, ranging from tummy tucks to facelifts. Board-certified by the American Board of Plastic Surgery, she says her commitment to her patients has been the cornerstone of her practice and she is grateful to be honored by such a meaningful award. Dr. McCormack also says the award gives her further motivation to strive for excellent and personalized patient care knowing that her patients have been appreciative of her efforts. “I believe that it is important for prospective patients to know that other patients have not only chosen us but felt they made the right decision as well. We will, as we always have, strive to treat patients with skill, respect, and dignity,” says Dr. McCormack. The Patients’ Choice Award is bestowed upon doctors whom have received top scores from their patients on review websites such as Vitals or Healthgrades. Physicians are ranked based on their bedside manner, the accuracy of their diagnosis, time spent with patients, follow-up care, and other aspects of patient satisfaction. Compiled by American Registry, LLC based on these patient reviews and other quality measures, the Patients’ Choice Award for 2011 was only given to 5 percent of the 830,000 active physicians in the nation. Also included in the The RegistryTM of Business Excellence, Dr. McCormack says she is excited for the opportunity to continue serving her patients and grateful for the time they took to write positive reviews. Dr. McCormack adds that she urges patients considering any cosmetic procedure, whether it be breast augmentation or a dermal filler, to consult with a board-certified plastic surgeon with extensive experience so as to ensure they receive the safest and most effective care available. “It is truly an honor to be selected. We work hard to provide outstanding patient care making the experience positive from beginning to end. It feels great to be recognized for this,” she says. Board-certified in plastic surgery, Dr. Tiffany McCormack completed her plastic surgery residency at Stanford University Medical Center. She is a Fellow of the American College of Surgeons and an active member of the American Society of Plastic Surgeons, the American Society for Aesthetic Plastic Surgery, and the American Society of Bariatric Plastic Surgeons. Dr. McCormack dedicates much of her time to continued education, having been published in several medical books and journals in a wide range of topics. She has also spent time abroad to offer her expertise in repairing craniofacial abnormalities in underprivileged communities. Located at 10685 Professional Circle, Suite B in Reno, NV, McCormack Plastic Surgery can be reached at (775) 284-2020. It can also be contacted online via the websites plasticsurgeryrenotahoe.com, mommymakeoverreno.com, or facebook.com/McCormackPlasticSurgery.